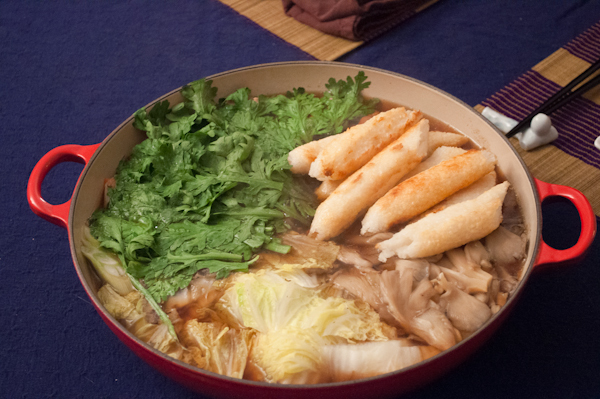 Another recent nabe that I made, this one called the “Akita Hunter Hot Pot.” The defining characteristic of this hot pot is a rice preparation called kiritanpo. It’s made by cooking rice, mashing it up, forming it into a cylinder (around a chopstick or similar) and grilling or broiling it before adding it to the hot pot. Ostensibly, these rice cakes would be carried by the titular hunters, grilled over an open fire, then added to a hot pot with mushrooms, chicken and vegetables. Frustratingly, I couldn’t find any burdock root; I seem to be unable to secure all the authentic ingredients for one of these recipes at any given time. (I substituted carrot, and the added sweetness, which burdock would not have brought to the table, was quite nice.) I finally did find chrysanthemum greens, though, with a little help from the Chinatown issue of Lucky Peach. I had long assumed that chrysanthemum greens, known as shungiku in Japanese, were probably used in Chinese cooking as well, but I didn’t know what they were called until I read the magazine’s article on greens in Chinese cooking, which put me on the path to tong ho in Toronto’s Chinatown. They had a nice light bitterness, but other greens could quite easily be substituted in the future. As for the kiritanpo, they were delicious. A little tough after broiling, they softened nicely in the savoury chicken stock-based broth, and the spots where the rice browned reminded me that there are more dimensions to the flavour of rice than we experience just through boiling or steaming it.